We supply Polymerase Chain Reaction (PCR) assays for a large range of infectious diseases, automimmune conditions and other tests. Our PCR kit manufacturers include Mikrogen, Liferiver, Sansure and Clonit, bringing you a huge range of high quality PCR testing kits for almost every need. The ampliCube HEV 2.0 is a highly sensitive, flexible and easy-to-use real-time RT-PCR test system for the detection of infectious disease genotypes in human serum or plasma. The test is suitable for single sample testing (ID-NAT) and sample pool testing (MP-NAT). 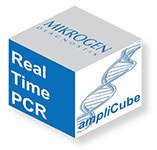 With high sensitivity, easy-to-use blue enzyme mix, full controls included and CE mark compliance, Mikrogen ampliCube PCR kits are a leader in the market. Liferiver is one of the biggest and most influential manufacturers of PCR kits in China, with over 170 different products, including many exotic and uncommon tests. All Liferiver PCR kits are ISO9001 and ISO13485 certified and have a high sensitivity and specificity. The kits have a rapid operating time and good stability for storage. All kits come ready to use and are fully automatable. Sansure is a leading manufacturer of PCR kits for infectious diseases. Sansure kits employ One-Step technology, providing the world’s easiest-operation DNA diagnostic kits. Sansure kits have a reduced operating time of more than 70% over standard kits and have a precision and sensitivity 5-10 times higher than existing PCR diagnostic products in the market.